Enterprise users expect voice services to be reliable and high quality, which means that IT departments need to maintain focus on how their evolving network needs impact their voice network strategy. As traditional time-division multiplexing (TDM) voice services are replaced by IP voice, decisions about voice strategy need to be carefully considered. Our team has decades of experience delivering some of the most complex voice network solutions. We partner with dozens of suppliers who offer voice services, including many with tools to solve for specific business needs. Increasingly, large enterprises are rapidly adopting video for their ever-growing remote workforces. 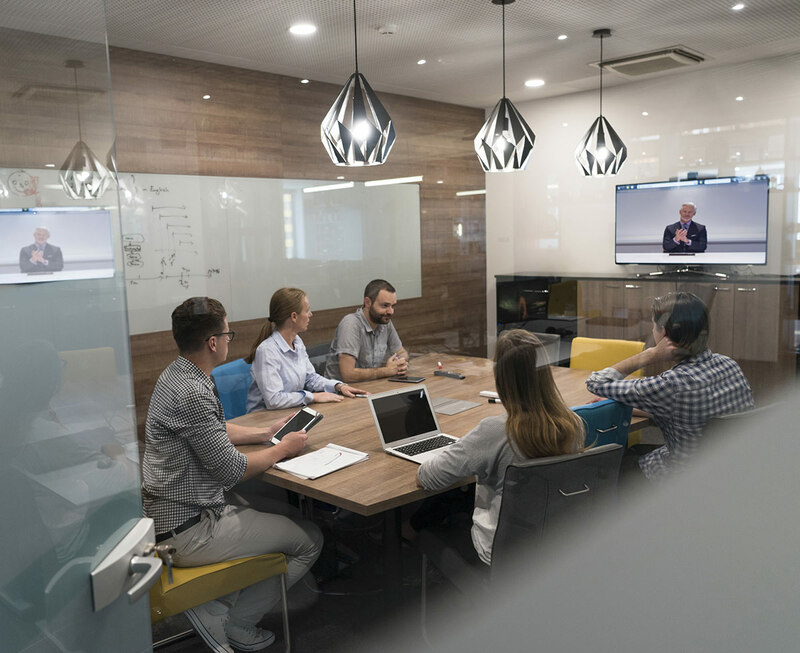 High quality video conference calls offer a unique advantage for your workforce by enabling them to have more effective meetings across the globe. The MacronetTM portfolio includes most of the leading global suppliers of video conferencing software and hardware solutions. Our unique experience working with all types of organizations will allow us to ensure that your strategy delivers the best user experience no matter where your employees work. The market for instant messaging is rapidly evolving to integrate modern business technologies into unified messaging platforms that enhance team collaboration. Many of these platforms now include file sharing and indexing, task management, and specialized integrations. Different supplier offerings have emerged as leaders in various niche markets. MacronetTM has access to most of the leading suppliers of unified messaging solutions and can help your team evaluate and implement the solutions which best match your unique needs. Audio conferencing solutions are one of the most widely used tools for real-time group collaboration. Audio conferencing has many variations and a long list of available features for administrators, organizers, and attendees. MacronetTM has access to hundreds of audio conferencing solutions and can help ensure you are getting the lowest cost, highest quality solution for your users. Our extensive industry experience puts your team in a position to take advantage of these mission critical technologies to create a unique differentiator for your team. Enterprise IT Teams are looking to provide their business with bleeding edge communications technologies. Having a well-defined unified communications strategy will enable your business to seamlessly communicate across any device globally. Consolidating the number of communications tools your employees communicate with can save money and substantially improve productivity across the enterprise, internally and externally. Our approach involves helping you strategize with your team on which solutions will most effectively improve your communication efficiency and lower your overall TCO. MacronetTM represents all the key leaders in the UCaaS marketplace including names like RingCentral, 8×8, Fuze, Zoom, WestIP, Skype for Business, Arkadin, CallTower, Jive and more. Each UCaaS provider has gone to market with a slightly different approach and our team will help design and source the solutions that meet the unique communications and conferencing requirements of your business.